The new 58-floor building aims to become an anchor of cool in a pin-striped neighborhood. Nearly two years later than planned, the W New York Downtown Hotel and Residences will celebrate a soft opening on July 27, and begin welcoming hotel guests on August 16 (residents will move in this fall). Located just a block away from the World Trade Center site, the property was purchased by developer Joseph Moinian in 2005, long before the economy crumbled. A major developer of downtown New York, Moinian has high hopes that the location will become a lifestyle anchor for the neighborhood. German design firm Graft was enlisted to create the building’s interiors, and has lent a minimal and futuristic feel to the space, which consists of 217 hotel rooms and 223 condominiums–one and two bedroom units which sell for up to $2.8 million. Here’s a sneak peak at a downtown hotspot in the making. The ribbon-like motif in the kitchen is carried throughout the units, creating a cohesive feel. The units are available unfurnished and furnished, and thanks to the open layout, feel more spacious than they actually are (though my Manhattan standards, they’re sometimes huge–the largest two-bedroom is 1,175 square feet). The floors and walls of the units’ bathrooms feature tile designed to look like reptile leather. The shower can be equipped with touch screen glass that will frost on command, for privacy. The animal theme is carried to the bedroom and living rooms, where window seats are designed to look like ostrich leather. 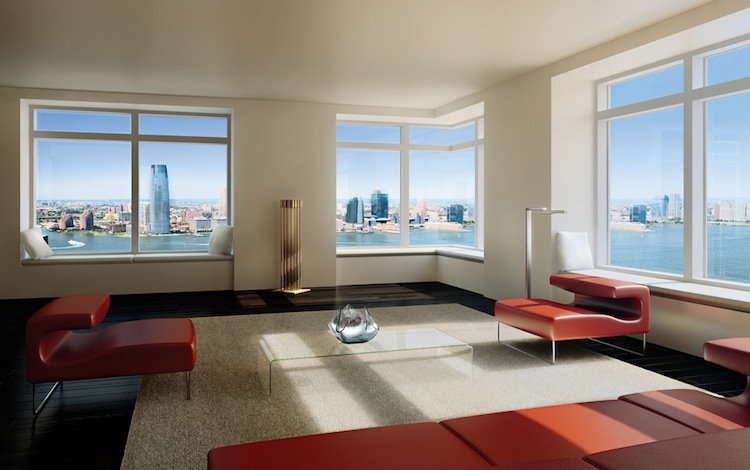 The large windows offer spectacular views: South-facing units see the New York Harbor and Statue of Liberty; North-facing units see the World Trade Center construction site and the full skyline of Manhattan. 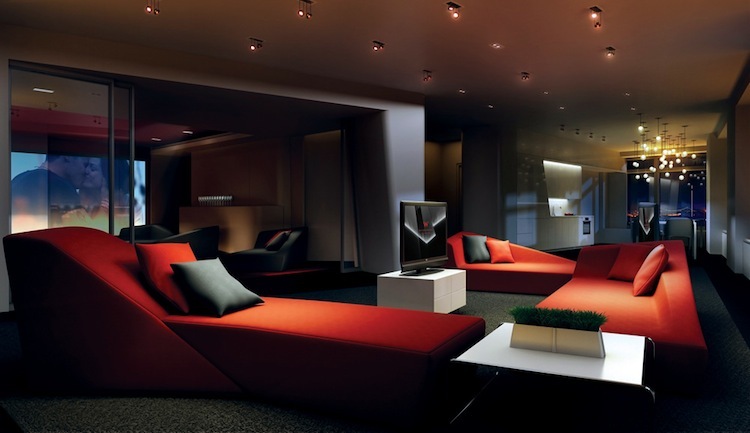 The digital lounge is one of the many community spaces for residents, and continues the building’s emphasis on light, movement, and texture, in addition to a sense of drama and surprise–the perfect place to gather for a movie viewing. 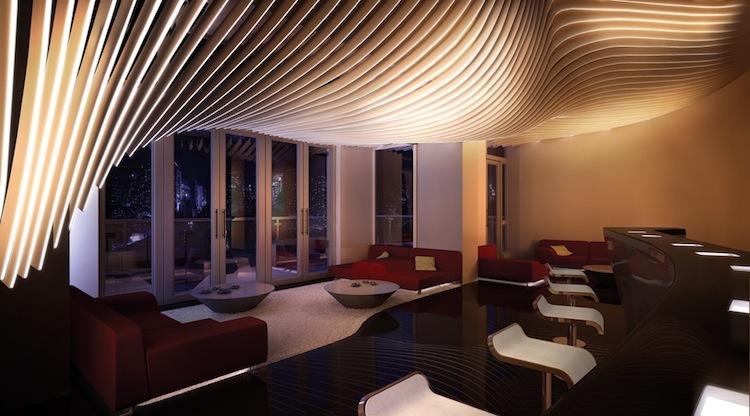 This bar and lounge is yet another residential space, in addition to the digital lounge and roof terrace (the highest residential terrace in the city). Construction at the World Trade Center will stretch on for years, though all W New York Downtown windows are insulated to keep out noise. Until then, hotel rates will likely be a bit cheaper, to reflect the ongoing work in the area.